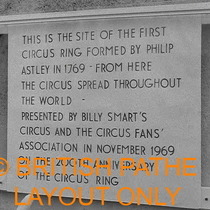 This is the site of the first circus ring formed by Philip Astley in 1769 - from here the circus spread throughout the world - Presented by Billy Smart's Circus and the Circus Fans' Association in November 1969, on the 200th anniversary of the circus ring. The plaque is no longer there and actually looks like it was not intended to be permanent since it was attached to wooden battens rather than directly to the wall. 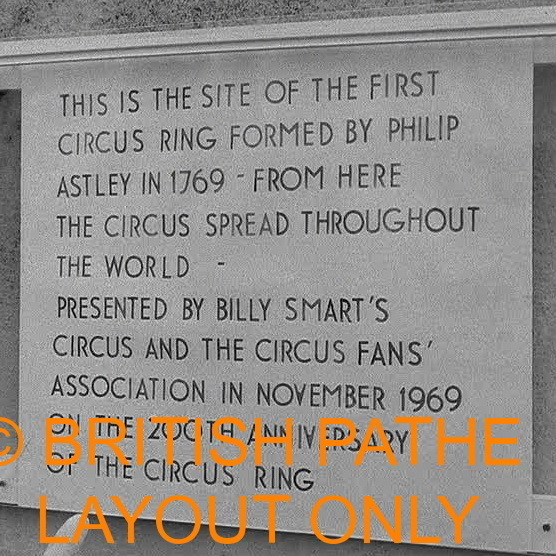 We thank Jamie Davis for finding this link to the British Pathe news film of the unveiling of this plaque. The observant amongst you will note that our plaque picture is a still from the film. That's because the plaque is no longer there. From clues in the video we identified the exact location. It's visible in our photo of the John By plaque - the stone upright in front of the woman walking on her own. We visited and found .... four screw holes, but no plaque. The plaque was erected some distance from the site of the commemorated building which is odd since the Amphitheatre is clearly marked on maps of the period. The film shows the parade of performers from Billy Smart's Circus, from Lambeth Bridge to the plaque site; ring-master, horses, Red Indians, clowns, dancing girls, etc, all shivering slightly on a dull November day. The plaque was unveiled by Toto the Clown, who else?